This video “is a complex story about personal transformation, self-discovery and how one man’s journey to find a sense of belonging would in essence give him purpose,” producer Torin Simpson explains. 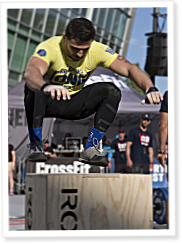 That one man is Nuno Costa, an athlete and CrossFit Level 1 Seminar Staff member who trains and coaches at CrossFit Invictus. CrossFit continues to grow in all parts of the world, and Russia is no exception. In December 2014, CrossFit offered a Level 1 Certificate Course at CrossFit Geraklion in Moscow. The course was translated into Russian by Level 1 Seminar Staff member Dmitry Andryukhin, and participants came from as far away as Siberia to hear the material in their native language. In this video filmed in June, members of CrossFit’s Seminar Staff are delivering the second of two Level 1 Certificate Courses in Shanghai, China—the first Level 1s offered in the most world’s most populous country. About half the seminar’s 20 participants speak English, while the other half speak Mandarin, so all content is translated. “Language barrier is always something that has to be negotiated,” says staff member Brett Fforde. Not many people know Austin Malleolo was the type of renegade who was in trouble with the law and ended up going to reform school for two years. “It was a big turning point for me from the perspective of ‘the decisions I make and the people I surround myself with can directly affect my entire life,’” he says of reform school. On Episode 269 of CrossFit Radio, host Justin Judkins interviewed CrossFit King of Prussia owner Aimee Lyons and Level 1 Seminar Staff member Joe Alexander. This episode was webcast live at 6 p.m. PDT on Wednesday, March 27, 2013.